This remarkable artefact was recovered by our archaeologists in 2001. It came from the grave of a woman aged 26–35 years who was laid to rest in Roman Gloucester’s South Gate cemetery. 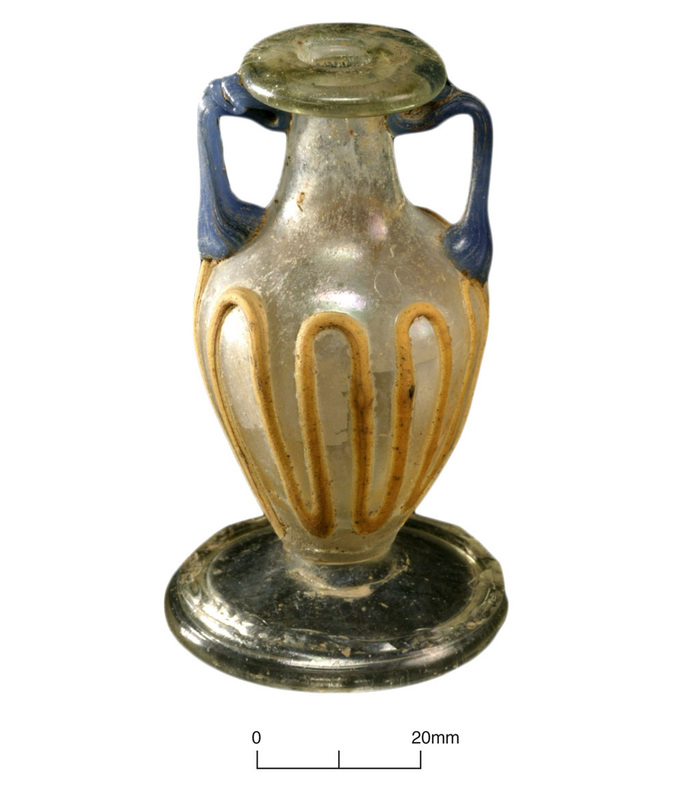 The glass flask, which stands approximately 83mm high, dates to c. AD 200 and is an import from the area of Cologne in Germany. The coloured glass decoration is an example of the ‘snakes thread’ style, where a colourless ground is enlivened by polychrome trails. Although it looks complete, the object would originally have formed a miniature inside a much larger vessel in the manner of a ‘ship in a bottle’. The enclosing flask-like vessel would have joined the inner part at the top edge of the base. After breakage, the remnants of the outer vessel were carefully trimmed away and it is possible that the remaining portion was then used as a perfume flask. Similar vessels represent the very peak of the Roman glassmakers’ art, requiring great skill and doubtless highly valued. Although fragments of the snakes thread style are known from sites, as grave goods they are previously unknown from Roman Britain. It may be that this object was the personal possession of a wealthy individual acquired not through trade but via a personal connection with the Rhineland. It is hoped that future isotropic analysis of this lady’s bones will determine from where she originated. Her exquisite glass flask is on display in Gloucester’s City Museum and Art Gallery. With many thanks to Hilary Cool for information on the decorated glass flask.